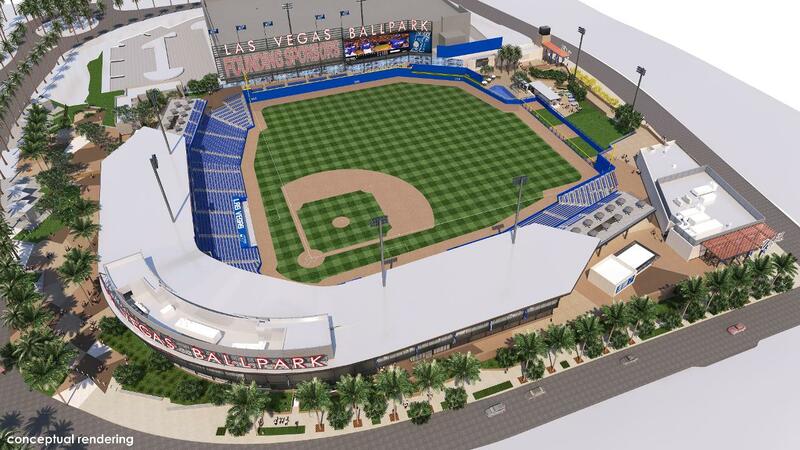 Las Vegas Ballpark, future home of the Las Vegas 51s, is under construction and slated to open for the 2019 season. The Las Vegas 51s have officially cashed out of Cashman Field. The Pacific Coast League franchise broke ground last week on Las Vegas Ballpark, which is slated to open next year. The 51s will be the boys of Summerlin, with the new facility located in the well-heeled planned community bearing that name. Summerlin, located immediately west of Las Vegas, was built on land initially purchased by Howard Hughes in 1952. Not coincidentally, the Howard Hughes Corporation acquired full ownership of the 51s last year. Las Vegas Ballpark is funded largely by a $80 million naming rights agreement with the Las Vegas Convention and Visitors Authority that will pay $4 million a year between 2019-38. It is designed by architectural firm HOK, with the Howard Hughes Corporation stating in a news release that the design "blends the distinct architectural style of the Summerlin community with the aviation legacy of Howard Hughes." According to the team, the approximately 10,000-seat stadium will contain "20 suites, party zones and decks, a kids' zone and bars and a pool beyond the outfield wall." The ballpark is located in close proximity to the City National Arena, practice facility for the National Hockey League's Vegas Golden Knights. At Friday's groundbreaking, 51s president Don Logan told Fox 5 Vegas, "The location [in Summerlin] is better than anywhere we ever talked about. If you've seen the design of this place, it's going to be phenomenal. The technology today is going to allow the stadium to function better than a lot of stadiums do." The 51s are the Triple-A affiliate of the Mets, although that partnership will end after the 2018 season (the Mets have purchased the Syracuse Chiefs and will have their Triple-A team play in upstate New York beginning in 2019). Thus, it remains to be seen with whom the 51s will be affiliated once they begin play at Las Vegas Ballpark. Cashman Field, operated by the Las Vegas Convention and Visitors Authority, opened in 1983. The facility's deteriorating infrastructure and relative lack of amenities had made Las Vegas an undesirable Triple-A affiliate in recent years. The 51s, who played as the Stars prior to a 2001 name change, have been Cashman Field's primary tenant throughout its existence. The 2019 season should see the opening of three new Minor League ballparks, with Las Vegas joining Fayetteville, North Carolina, and Amarillo, Texas. This number ties 2015 and 2010; the last time more than three Minor League stadiums opened in the same season was 2009, which saw the debut of five. The first six weeks of the year were stressful ones for the Rochester Red Wings, as the International League franchise and Monroe County were unable to agree on a long-term lease extension for Frontier Field, the team's longtime home. The negotiations dragged on so long that the league came up with a 2018 contingency plan for the Red Wings, who would play home games at nearby league ballparks. On Feb. 12, however, the Red Wings and county jointly announced a 10-year extension. The new lease calls for the team to pay $100,000 a year in rent, with the county responsible for ballpark improvements as stipulated by the league. The Red Wings, whose roots to the tail end of the 19th century, have played at Frontier Field since the facility opened in 1997. The Fresno Grizzlies, Triple-A affiliate of the Houston Astros, are under new ownership. The announcement was made at a Tuesday news conference at Chukchansi Park. Fresno Sports and Events, headed by banking and real estate businessman Ray Baker, is the new owner. The previous ownership group was Fresno Sports Management, headed by Chris Cummings. The Fresno Bee pegged the sale price as "between $17 million and $18 million." In a statement, the Grizzlies said the new ownership group "has agreed to a lease at Chukchansi Park guaranteed to keep the Grizzlies in Fresno through 2036. The Fresno City Council vote on the new lease was unanimous, 7-0." In conjunction with the announcement, the Grizzlies revealed that a new ballpark hospitality area is under construction down the left line. Perhaps more importantly, the price of 20-ounce beers was reduced from $8 to $5. The Greeneville Reds will play their inaugural season in 2018, taking over Pioneer Park after the Houston Astros decided not to field a team in the Appalachian League. The Cincinnati Reds recently hired Boyd Sports to manage the affiliate's day-to-day operations. Boyd Sports operates two other Tennessee-based Minor League teams, the Johnson City Cardinals (also in the Appalachian League) and the Double-A Tennessee Smokies of the Southern League.